A sharp data governance strategy allows healthcare organizations to better manage how information is collected, controlled, accessed, and used. With each new system, software, or information exchange connection, the volume of patient data for which healthcare organizations are responsible increases exponentially. As a result, even those that are years away from the hundreds of terabytes of information required to enter Big Data territory are discovering that data governance is the weakest link in their HIT project plans. Designing a data governance strategy can be daunting, but because of its role in the short- and long-term success of IT projects, it is no longer optional. The good news is that while data governance is an enterprisewide undertaking, it can be tackled incrementally. In fact, a bite-sized, per-project approach is perfectly acceptable and a smart way to lessen the intimidation factor. Kloss says when it comes to governance, there are three focus areas: IT governance, which governs the acquisition and management of technology; data governance, which focuses on the data flowing through the technology; and information governance, which encompasses all types of information, structured and unstructured, clinical and other types, and their use. As a result, information governance is the broadest concept, with IT and data governance being essential components. Most organizations have put in place reasonable IT governance, but the management of information and data assets is generally lagging. Data governance also plays the critical role of ensuring the integrity of the data being used to make both clinical and business decisions, says Paula Edwards, PhD, a partner with HIMformatics LLC, a strategic consulting firm focused on helping healthcare organizations maximize their technology investments. 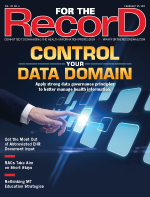 The focus on data integrity continues to sharpen as the healthcare industry evolves and consolidates. For example, acquisitions necessitate the merger of master patient indexes and financial records, while growing involvement in accountable care organizations and health information exchanges means care decisions are being based on information that often originates within other organizations. Further, increasingly complex technology and data usage under advanced stages of meaningful use requires greater integration between disparate systems, expanded data access, and an increased amount of information exchange. One of the easiest ways to understand the impact data governance can have on the success of IT projects is by examining the relationship between meaningful use and master data management, a key component of data governance. As part of their meaningful use strategies, facilities often purchase different modularly certified software to add on to existing systems. Whether these tools come from the same or different vendors, full integration is difficult to achieve. Edwards notes that a well-conceived data governance strategy must include defined roles and responsibilities that dictate how data are managed, including accountability for quality and guidelines for designing metrics and standards. Also important are policies governing how to manage data that flow across multiple systems. Kloss goes deeper, noting that the best data governance models include five elements, beginning with policies governing information design and data capture. The second element covers content and records management functions, such as how long information is retained and what constitutes the legal medical record. The third element is what Kloss refers to as information analysis and exchange. This piece of the data governance puzzle is beginning to play out as organizations start extracting data for use in analytics. Again, it must entail who can access the data and how they will be used, handled, and shared across the organization. Fourth is an umbrella element covering functions related to data integrity and quality, both of which must be managed proactively. This includes clear policies governing data entry, user training, and how databases are audited and errors corrected. When the realization hits that data governance is the weakest link in IT project planning, many organizations can quickly become paralyzed by the seemingly overwhelming nature of the work required to rectify the situation. But there are ways to make the prospect of creating data governance far less intimidating. For starters, it may not be feasible to tackle enterprisewide data governance. Developing strategies related to specific projects may be a more manageable approach. It allows organizations to evaluate polices that are already in place and leverage them to build individual elements of a framework that will eventually connect. Oftentimes, a new IT project is the ideal catalyst for getting the data governance ball rolling. When committees are put in place to design and oversee a project, add an evaluation of policies that guide the use of the technology tool to the task list. By tasking the committee that is already focused on other aspects of a project with designing governance around that project, it is far less intimidating and far more effective. By approaching data governance as part of an overall project plan, healthcare organizations can break through the paralysis that prevents many from tackling the issue head-on. It also ensures the strategy that is ultimately established is comprehensive and current rather than a retrofit of past policies that may be outdated. In addition to a multidisciplinary committee representing clinical, IT, HIM, and any other department that will interact with the data, appointing a well-respected leader to own data governance is a smart strategy. Such a tactic should keep things moving forward, even if it is incrementally by project.